At the start of the year, RE/code gave an announcement that it was teaming up with other tech companies Twitter and Stripe. They didn’t say what they were working on at the time but now it seems that they’ve launched their product. Which means that whoever is probably paying Twitter a lot of money will be included in the early rollout of this as one of their “selected partners”. 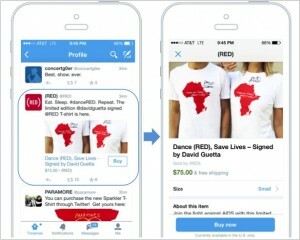 This seems to be the first step in making shopping easier from Twitter’s platform, especially on mobile devices. One of the USPs for this seems to be Twitter promising users of this new buy feature a chance to buy items that “they can’t get anywhere else”. The benefit here seems two fold, 1) Twitter will get more users signing up just to follow their favourite bands for exclusive merchandise, 2) Bans/brands/advertisers will see a surge in new follows based solely on the strength of the special offers they can promote. You can go through the purchase process in just a few taps and rest assured that your details are in safe hands. Twitter stores all your details securely and you have the option to remove them at any point.